Night and day the river flows. If time is the mind of space, the River is the soul of the desert. Brave boatmen come, they go, they die, thevoyage flows on forever. We are all canyoneers. We are all passengers on this little mossy ship, this delicate dory sailing round the sun that humans call the earth. Joy, shipmates, joy. The job is a combination of sales and vacation planning, and logistics. People in our office conveys the quality, heart, and accessibility of our trips; helps people get from wherever they live to where the guides pick them up; and makes sure that all the outside people and venders that help with our trips are on the same page. The position requires good organizational skills, being extremely detail oriented, the ability to self-manage, and someone who truly likes people. We are a small company so many times you are working alone, you need to be good at self-managing, and you need to be willing to jump into random jobs and projects as needs arrive. There is also the opportunity for the right person to continue on full-time year around. – Returning emails and answering phone calls from guests about new reservations and trip and vacation planning (this is a big portion of the day). – Following up with past guest inquires. – Coordinating with the shuttle companies and other venders that help make our trips run smoothly. – Reminding staff of their upcoming trips. – Fri – Mon or Tuesday depending on the week. 30 hours base with more available for those who want it. Most importantly we are looking for positive and friendly individuals who truly like people – This is always number one with us. Ultimately we are in the service industry and truly understanding and enjoying people (even the more difficult ones) and truly being empathetic is very important. We are also looking for people who are hardworking, eager to learn about guided river trips and the travel industry, eager and willing to do a wide variety of jobs (not all of them glamorous:)), and who love planning peoples vacations. If you are missing some skills yet are willing to learn and are positive and passionate we would love to work with you. People can learn almost anything if they want to – having the right attitude, being positive, and having an open mind, is the most important part. – Truly Positive People – People who are warm and friendly and who possess compassion, patience, and a positive and constructive sense of humor in the face of obstacles. – People who truly like people – who strive to always find a way to connect with each and every guest and appreciate each person for who they are. Someone who is comfortable carrying on conversations with individuals from all walks of life (but in this job someone who is also ok working alone). – People with strong social awareness – people who understand the effects they are having on the people around them – guests and coworkers – and can read social cues and people’s moods and adapt to those challenges naturally and easily. – Resourceful People – People who are good at solving challenging problems and thinking on their feet while at the same time working within the structure of a system. Most importantly people who are good at anticipating problems before they happen – whenever possible being pro-active instead of re-active. – Very Detail Oriented but also understanding the Big Picture – People who can stay focused on details while never losing sight of the big picture and the feeling and experience we are trying to convey. We are a small guide owned and operated company that runs mostly small personal trips. It is our goal to “re-invent” the way rafting trips are run. To set the standard for guest service, trip quality, risk management, and the overall river experience. The trips we offer are incredible varied; from class V to class III, from lush Pacific Northwest settings to high desert environments, from narrow granite canyons to volcanic basalt towers, and from 1/2 day trips to 9 day wilderness adventures. The spring consists of a mix of Class V through III and inflatable kayaking and the summer is a mix of class IV+, III, and inflatable kayaking. Many of our rivers tend to be rarely run and off the beaten path and we love running custom trips with varied itineraries. Enjoy it in small groups, with unparalleled personal service, and with guides who have a passion for guiding. We offer world-class rafting trips to select destinations abroad & in the Northern California, Oregon, and Idaho region. The area is a playground of natural wonders, rich with cultural events, and overflowing with amazing whitewater. Guide-owned & operated we are a small company, allowing us to focus our energy, resources, and passion for guiding into every trip we run. Our trips are small with unparalleled personal service and a handcrafted quality and attention to detail. They are led by some of the finest guides anywhere – guides who have run some of the most difficult and beautiful rivers in the world, who love to share these places with others, and who are friendly and warm hearted. 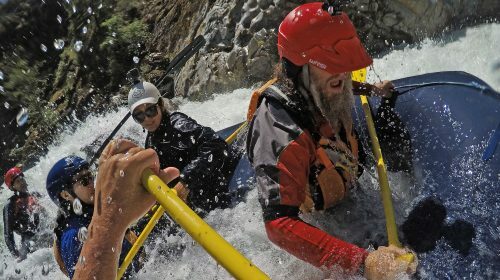 Momentum started with a van, two rafts, more rivers then guests, and a desire to “re-invent” the way rafting trips are run. Now we are honored to offer trips on all of the region’s most spectacular rivers – and with this region that says a lot. Although our trips and our company are still small, the richness and diversity of this area allows us to offer river adventures with a quality and a variety that is rivaled by few. 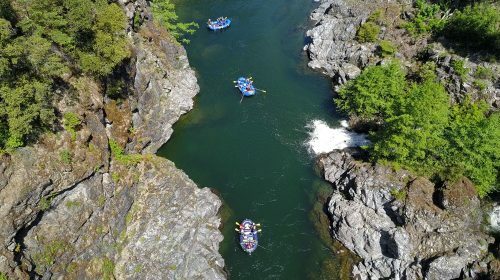 Our adventures range from mild to heart-pounding; from “wow, I can’t believe we just did that” rapids to jaw dropping beauty that can be enjoyed by three generations of family and friends; from day trips near our home in Ashland Oregon to 9-day wilderness journeys. The majority of our trips are off the beaten path and all offer incredible whitewater and scenery. They are a mix of service, relaxation, excitement, and wild beauty – a chance to step out of civilization for a short time and step into a more simple and uncomplicated life. While we do run some of the biggest rivers anywhere for most of our trips you do not need to be an experienced adventurer, an athlete, or even to have ever touched a paddle or spent a night under the stars. Our trips are designed for those who like or want to be introduced to the outdoors and our goal is to make these places we love accessible to everyone. So, whether you’re a first-time paddler or a seasoned whitewater connoisseur, join us for a rafting adventure like no other! We do some things a little different than many river and outdoor adventure companies. We believe that some in the outdoor industry have gotten a little lost. That they have forgotten what it truly means to be a guide and an outfitter and what it truly means to run a good trip. That they have forgotten that providing a truly amazing experience to guests is what will do the most towards protecting all these wild rivers and places that we love. That they have stopped improving the craft of guiding and adventure travel, have gotten stale, and in some cases very negative. Because of this we sometimes challenge the “this is the way it has always been done” attitude and we always put the guest experience first. At our core we are extremely guest oriented. Most of our guests return year after year and some become friends off the river. You can read some of our guest testimonials here. We run a huge variety of rivers and trips for such a small company. This is especially true during the spring. There may not be another company in the U.S. that has a busier or more diverse spring season. All the rivers we advertise we actually run. We run more trips on rivers such as the Cal Salmon and the Illinois then all other outfitters combined. Many times we are as busy in May as we are in July. We also run a lot of rivers that have temperamental flows, weather, and access. Last minute logistical changes and river changes happen and need to be dealt with as seamlessly as possible and with a ton of positive energy. Because of this we need dynamic people who can deal with last minute change. We love and rely on the natural environment and are deeply and actively committed to its protection. Our river trips feature organic meals, wonderful guides, and are a great way to support and become immersed in these wild places. We are strong believers in the models set by companies such as Patagonia and believe business can inspire solutions to the environmental crisis. You can read more here. The idea of keeping places you find a complete secret can be short sighted and a little elitist. Eventually the fate of those places will depend how many people know and love them. The more people who experience our rivers, who fall in love with them, who are shown them by a passionate guide – the more people will think about rivers when they go to vote. There is, of course, a limit to the number of people who can experience a place at one time without damaging both the place and the wilderness feel. – We do not always do things the way other companies do. – The owner also loves actually being out on the river and guiding – meaning that a lot of responsibility is put on guides and staff to work without supervision, to resolve any conflicts on their own, while still doing things in a way that reflects the values of Momentum. – We have high standards and idealistic goals. We do not always make it, but we always keep trying and learning. – Guests come first – and guiding is a service industry. For those who are burnt out on guests or even worse – feel the industry is attracting the wrong type of guests or becoming too service oriented Momentum will definitely not work. Some of these have been mentioned above, but it nice to have them in a list. Some have also been mentioned in the drawbacks:). – A small company with a big companies menu of rivers. We run some of the best rivers anywhere and many of our rivers are off the beaten path and rarely run. – There may not be another company in the U.S. that has a busier or more diverse spring season. It is awesome. – Custom trips with small groups – from airport to river to airport we have custom itineraries with groups that have been as small as 2 people. – We are deeply committed to the environment and environmental causes. – We are guide owned and the owner guides a lot. – You work with only experienced guides that are some of the best in their field. – We are proud of the trips we run – Guests come first. – The Ashland area is an amazing place to live. – Amazing guests – this is something we hear over and over from our guides and staff. That was a lot, but we want to make sure that Momentum is a good fit. As mentioned, we have an extremely high return rate among staff (almost nobody ever completely leaves :)) – it is like family. Once again we urge you to check out our website including the About Momentum Page and the Why Momentum page. (please do not call – we will not hire from calls). Your resume should include the last 3 places you have worked and references. – A list of all your computer skills and programs used. We are a family of 7 (2 parents and 3 youngsters of 10, 16 and 18, and my 70+ year old parents) and are interested in taking a river trip. We are not sure if it is possible to find a trip that would work for the whole family, but, looking at your website, we were interested in maybe the Rogue or the Idaho Salmon? What is the difference between those trips? Do you think one would work for us? Also, we like the look of Momentum, but a friend recommended another company that is a little less expensive. What makes you guys different? We are looking to hire someoneby the end of March. We will not be looking through applications before March 15th. Once again, please do not call. Email us your resume and any other information. Thanks so much – looking forward to hearing from you!